The Place When I heard that there is a new restaurant in Destination Singapore Beach Road, my first thought is that this business will be challenging because of the location. It was a right decision. Folklore, a relatively new Singapore Heritage restaurant helmed by Chef Damien D’Silva, is located within the hotel managed by the Park Hotel Group. The casual setting of Folklore has seating capacity of 100, with an open and spacious interior decorated by touches of Peranakan tiled tables. The restaurant and menu is inspired by Chef Damien’s Eurasian-Peranakan upbringing and childhood, as he seeks to share and tell the stories of Singapore Heritage cuisine through his dishes. The Food A misconception I had prior to my visit was my assumption that Folklore is a Peranakan restaurant, though this is only one fifth right. The menu in fact encompasses food from the five ethic groups in Singapore – Chinese, Indian, Malay, Peranakan and Eurasian, with some of the dishes created from family recipes passed down for generations. We started excitedly with the Singgang (S$20), an Eurasian dish of deboned wolf herring cooked in a non spicy paste. The Rempah Titek paste was delicious and hearty to dig in, not forgetting the painstaking efforts of the kitchen to debone the fish before it was mixed with the paste. The 4 Angled Bean Salad (S$12) tasted like Thai’s version of Mango Salad, which looks harmless but it is relatively spicy. The red chillies, pineapple and kaffir like leaves are tossed with lime and sambal belachan sauce in this salad. Order with caution, I would say. A stark contrast from the previous two dishes is the Chilled Tofu with Pidan (S$12), which was timely as it acted well to counter some of the earlier spiciness. The soft tofu went well with the Japanese pickled radish and century egg (‘Pidan’), which I am usually not a fan of Pidan but found myself enjoying this dish quite a bit. Here comes one of the highlights of Folklore, at least for me. The Sambal Buah Keluak Fried Rice (S$22) is a must order. I am not sure when exactly I fell in love with Buah Keluak, one of the most exotic ingredient of Peranakan cuisine. Cooked with sambal paste, the Keluak meat added much oomph to the fragrant fried rice which is easily one of the best dishes I tried this year. I am not surprised to find out later than this dish has been one of Chef Damien’s signature dish for a very long time even in his previous establishments. Another of my favourite is the Masak Lemak (S$14), a Peranakan dish with Spinach, Sweet Potato Leaves and Kang Kong. The spicy paste here wasn’t that spicy, but it was so good. When I took the first mouth, I couldn’t help but comment that there is a very nice and strong shrimp flavour in the paste. The Babi Assam (S$22) is a sinful plate of braised pork belly in tamarind gravy, which takes a few hours to prepare. The pork belly had a very tender texture and juicy flavours. A dish which will go well with rice is the Oxtail Stew (S$26), an Eurasian dish Chef’s grandpa would prepare over the weekends. Cooked with potatoes and carrot, the Australia Oxtail had soaked in the flavours of the rich gravy well. If you are game for it, add on the spicy sambal belachan. 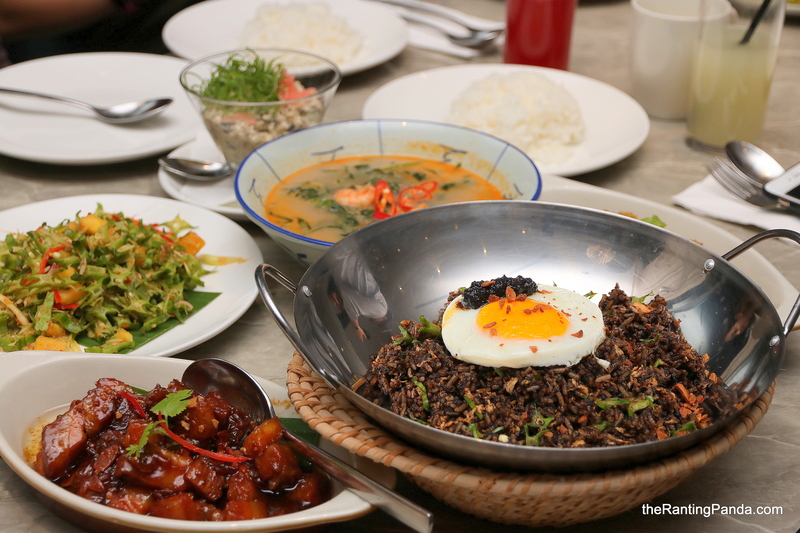 The Peranakan Chap Chye (S$16) is a classic Nonya dish which is a must order. Prepared with prawn and pork stock, the glass noodles and vegetables had soaked up the flavours of the stock well. This Peranakan and Melaka style is drier, but the flavours were not at all diminished. The last savoury dish we tried was the Sambal Juliana with Fried Brinjal (S$14), another dish which goes well with rice. There has been loads of sambal so far in the dishes we had and this was no exception. Save some space for desserts. The Kueh Kosui (S$6), steam tapioca kueh with gula melaka wrapped with grated coconut, is one of the best I ever had. The sweetness was just right, with a texture which wasn’t too starchy, and the coconut simply worked magic on the kueh. I can have a dozen of this. Alternatively, there is also the Kueh Bengkah with Ice Cream (S$10) and Baked custard with pudding (S$12). The former is baked tapioca cake, while the latter is a Spanish inspired dessert (“Koka”) topped with gula melaka. Rants Located right beside the small lobby of the hotel, the restaurant could be noisy if there is a big group of guests checking in. Will I Return Again? It has been a while since I had a hearty Singaporean style meal. There are no gimmicks to the food here at Folklore, come to enjoy the good food and best still, bring your folks along. I am betting they will love it. Make your reservation instantly at Folklore here.